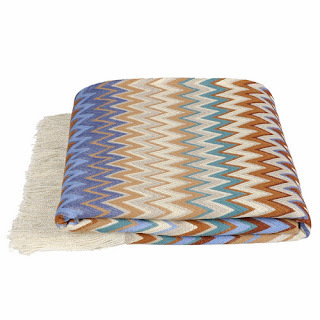 Purefecto: Missoni Margot Throw at a discount? You bet! 50% off? Checked. Free shipping? Checked. Fabulousness? Checked. What more can one ask for? Amara in UK has discounted their Margot Throw from Missoni by 50%!!! This is the cheapest Margot Throw I have seen on the market. Even Gilt.com sold theirs (in pink colorway) at full price few years ago. This particular colorway that Amara is discounting has a beautiful earth tone to it. It will work in a rustic setting or in Rachael Zoe's posh modern home. And because it has so many colors in it, you never have to worry about not being able to match it in most interior. They have three in stock. Pick one up before they are gone!